I found myself at gunpoint again in early 1995 when I tried to sneak across the border to Minthamee Camp with a foreign journalist. It was a sunny afternoon in January 1995. I was on my way back from the ABSDF office in Bangkok to Minthamee camp, across the border from Hwaynamkhong in Thailand’s Kanchanaburi province, accompanied by a western journalist. We got off the bus just before we reached a Thai border checkpoint and walked along a jungle path to our camp as we often did when crossing the border to avoid questions from Thai soldiers. But this time, unbeknown to us, Thai villagers informed the checkpoint officials that a white man had followed a Burmese man into the jungle. After we had been walking for about 15 minutes, I heard Thai voices and the heavy tread of jungle boots. First we hid behind a big tree but then I began to worry that they might shoot us by mistake and so I called out, “We are here”. Three Thai border guards pointed their M-16 rifles at us and took us to their base. They asked me many questions in Thai. My Thai language skills had improved by this time, but I was still not able to communicate easily so the guards contacted some KNU officials nearby. “Why is a farang [foreigner] going with you into the jungle?” the Thai officer asked me. After a night in jail in the army hut and hours of discussion at Kanchanaburi police station, we were finally allowed to proceed to our camp. Minthamee is located between Kanchanaburi province in Thailand and the Tavoy district of Burma. We built the camp in the hills alongside the Tenasserim river. “This is such a nice place with a good view,” the Austrian videojournalist said when we arrived at my hut by the river. We had never thought of our place as nice but for him, a western journalist, everything was new and interesting. His visit gave me my first opportunity to learn how professional journalists work on the ground. The Austrian had come to our camp to make a short documentary about ABSDF activities. He wanted to focus on our military actions, so we took him to the frontline where we faced Burmese troops. It was not an easy journey from Minthamee camp in the border area to the Andaman Sea. After two days on a tail-boat along the Tenasserim river and another two days on foot, we reached Pyicha village in Palaw township where our frontline troops were based. The Austrian video-journalist actually wanted to film while we were fighting with the SPDC troops, but this would have been a deadly game. So I told my column commander Hla Oo (who is now resettled in US) to avoid enemy outposts as we made our way to Lake-U-Thaung, a coastal village where we were due to address a public meeting. After five nights and four days travelling along the Andaman coast, we concluded our trip with a speech at a public meeting at a bus station in nearby Palaw town. 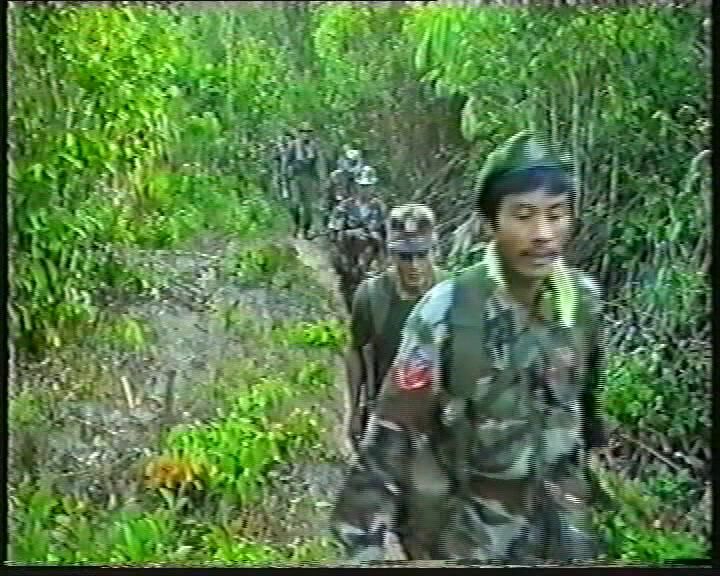 The hour-long documentary “Knife to Knife, Lance to Lance” that resulted from this trip was broadcast in Austria in 1996 and DVB has often used the footage taken for stories on the ABSDF and jungle life.